It is common for people to buy skin care products over the counter, after seeing the TV commercials or being recommended by a friend. But, if you are experiencing any of these adverse reactions, it might be due to your skin care regimen. It is tempting to buy a product with the most attractive packing or one with an impressive commercial, but only because it works for one person doesn’t mean it will work for all. Other than the magic active ingredient that the brand is advertising, it can contain many potentially allergenic or irritating inactive ingredients that are responsible for its fragrance, silky feel or extended shelf-life. If you see rashes after a few applications, it is most likely because of one of the ingredients. If you experience severe dryness, peeling and flaking around your mouth or nose, you might be just overusing an acne cream, like benzoyl peroxide or retinoid. Topical retinoid assist lightly exfoliate skin, regulate skin cell maturation and cause slight irritation in the skin, which boosts new collagen growth. If you experience constant peeling and your face is red, then this might not be the best anti-aging treatment for you. This situation is different than the one we just discussed above. Your skin has already verified previously of the product and its ingredients that it is okay with the ingredients of the product. A possibility in such cases is that you are possibly using too much of the product or using it too often. Slight burning, redness and rashes are common side effects in patients with sensitive skin. Patients with sensitive skin must choose the products carefully. Also, don’t use more than a pea-sized amount of the cream or lotion. Whether it a cleanser, toner or lotion- no skin-care product should cause burning. According to expert dermatologists, it is usually an indication that you are allergic to it. Some acid and enzyme-based masks can cause mild burning sensation on the skin for about a minute, but if you feel your skin is on fire, don’t suffer expecting miraculous results- wash it off. You are either allergic to some of the ingredients of the product or your skin is over sensitive for its composition. So, if you experience any of the above symptoms discontinue using the product now and consult at Dr. Meet’s Clinic. We provide effective and safe chemical peel treatment. Is Chemical Peel A Good Acne Scar Treatment? It is simple to go to a pharmacy and find many solutions for acne- but when it comes to acne scar treatment finding a cream or lotion is not that easy. People want acne scars to disappear as quickly as possible, but treatments are not as easy as buying a cream. Don’t worry, because chemical peel could be the answer to your scar issues. Chemical peel is a procedure in which skin-friendly chemicals are applied to the skin, usually on the face, neck or hands. They exfoliate the skin and as a result, skin eventually peels off. The final result is smoother skin. While its primary purpose is to even out skin tone and smooth imperfection, there are different types of chemical peels for different requirements. The first type is the superficial one in which the chemical doesn’t penetrate beyond the first epidermal layer of the skin. This type of peel is helpful to even out skin tone and gently exfoliate. The second type is called a ‘medium’ peel, which targets damaged skin cells on both the outer and middle layers of skin. It is used to treat wrinkles, age spots and even freckles. The third one is called as a ‘deep’ peel. Just like its name, this procedure penetrates deeply into the middle layer of skin. It is effective on freckles, wrinkles, skin discoloration and due to its deeper penetration, it also removes scars. What does a chemical do? The term ‘chemical peel’ may sound scary. Chemicals on your skin? Ouch! However, the chemicals used in this procedure are skin friendly and proven. And the most discomfort you will probably experience with this procedure is slight stinging. You can also notice crusting, irritation and redness. It is important to consult a reputed doctor or dermatologist to find out whether or not a chemical peel is right for you. There are conditions when a chemical peel is not recommended, like during pregnancy or if you have broken or cut skin. It is also not recommended to have a chemical peel when you have rosacea, dermatitis, eczema and psoriasis. However, when it comes to acne scar treatment, chemical peel is an effective solution. As the outer layer of old skin is removed during the peeling process, the new skin that replaces it is often smoother, clearer. The result is a reduction in the appearance of scars. For scar treatment or chemical peel in Indore, feel free to contact Dr. Meet’s Clinic. What To Expect From Chemical Peel? Markets are flooded with products that claim to make your skin better, but probably one of the best treatments today is chemical peel. Chemical peeling is usually performed on face, neck or hands. In this type of treatment a chemical solution is applied directly on the skin that makes the skin to blister and then come off eventually. The new skin that is revealed is generally smoother with less appearance of fine lines than the skin that was initially treated. The new skin is initially more sensitive to the Sun, thus you must avoid exposure to sun for time being or use sunscreen when going out. Cosmetologists use various peeling agents and specialize in performing various types of chemical peels. Just like any procedure, you must consult a doctor to determine which procedure is right for you. Chemical peel is most popularly used for treating fine lines around the eyes and mouth. This procedure decreases or even completely removes wrinkles that have been caused due to aging, hereditary factors and sun damage. Not many people know but mild scarring and some types of acne can also be treated with chemical peels. Also, pigmentation of the skin, like age spots, liver spots, sun spots, blotching from birth control pills. Freckles and skin that is flat colored or dull or textures can be improved with chemical peeling. After chemical peel, lesions or new patches are less likely to be visible. Generally, people with fair skin or have light colored hair are good candidates for this type of treatment. 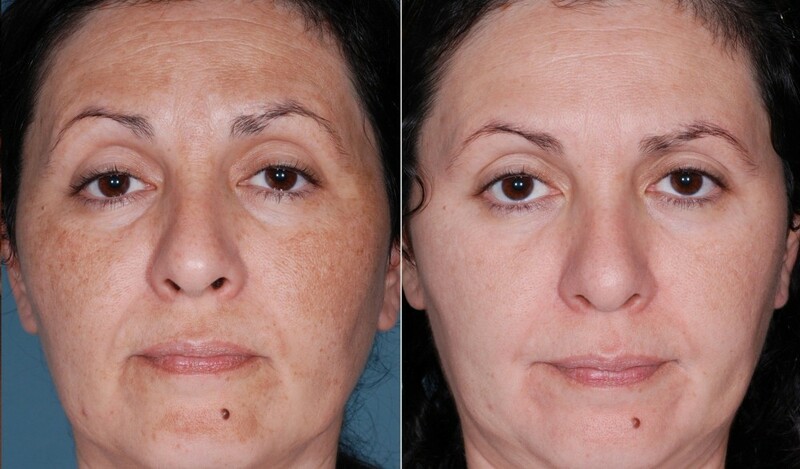 However, people with darker skin types also benefit from this procedure and experience positive results. Home Chemical Peel or Consult a Cosmetologist? When it comes to getting a chemical peel, in general there are two options. First, you can either buy a chemical peel kit and perform the procedure on your own in your home, or you can consult a cosmetologist and get the procedure done. Well, from the two consulting experts, for sure is the best option because they are experienced and customize the treatment according to your skin problems and ensure that results are satisfactory as well as noticeable. But chemical peel kits on the other hand, have a very mild composition and you can’t be sure whether it will work for your skin type and problem or not. Also, you are not sure that how your skin will react to it. What if it doesn’t suit you and makes your skin worst? One thing is for sure that chemical peel kits are more reasonably priced as compared to an expert’s treatment, but the later is safer and more effective. 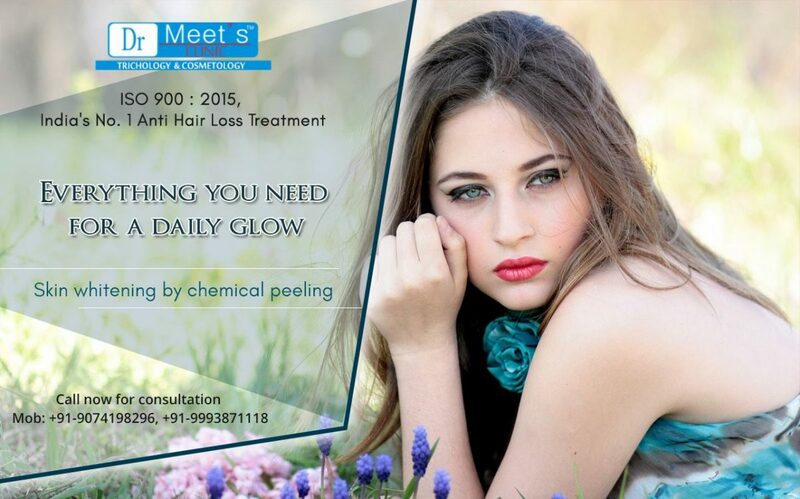 For chemical peel in Indore, feel free to consult Dr. Meet’s Clinic.